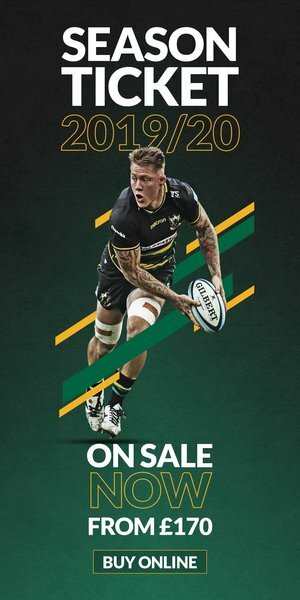 50% off 2018/19 Replica kit in the Saints Store sale! 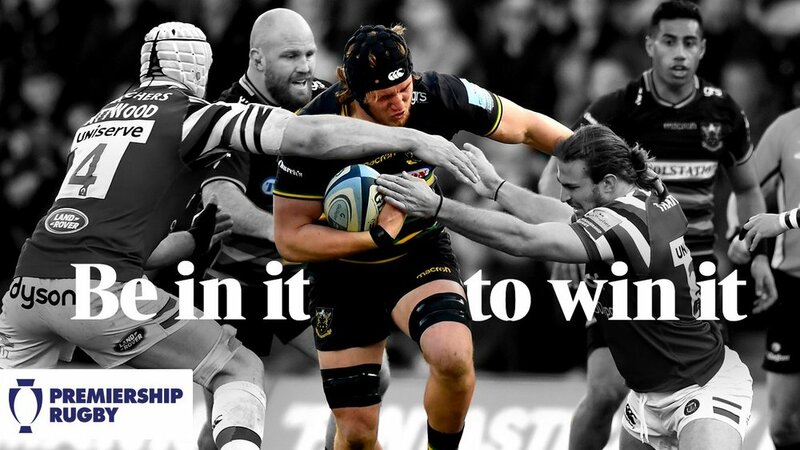 Get your ticket to the Premiership Rugby Cup final! 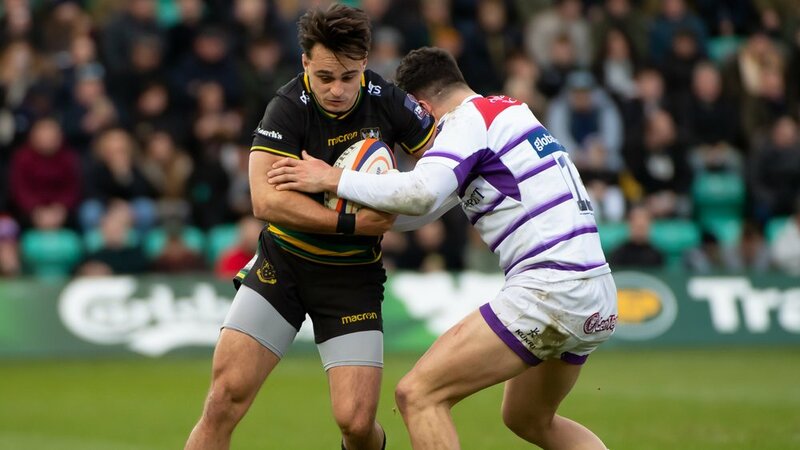 Heading back into the Gallagher Premiership following three straight home victories and securing their place in the Premiership Rugby Cup final, Saints return to Franklin's Gardens to host Sale Sharks this Saturday (kick-off 2pm). Make sure you don't miss out on Saturday's action by turning up at the ground too late - kick-off is 2pm, don't be late! 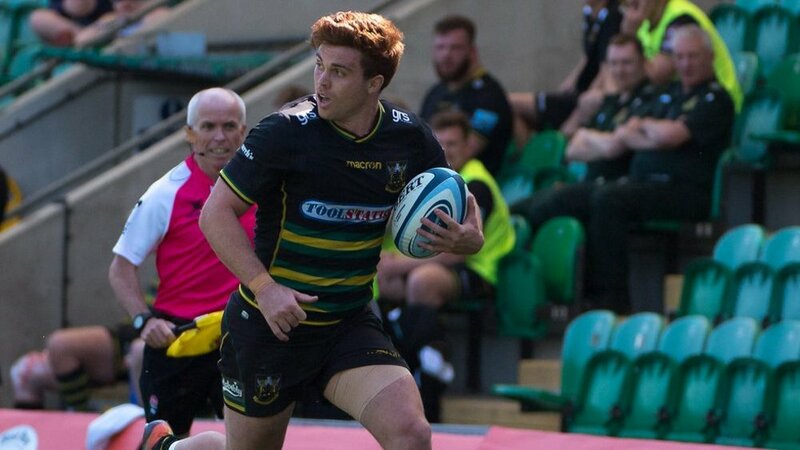 Tickets for the Premiership Rugby Cup Final, where Saints take on Saracens on Sunday 17 March (kick-off 3pm), will be on sale from Thursday and you'll be able to purchase yours at the game this weekend - tickets start from £15 (general sale) and £10 (Season Ticket Holders). And don't forget - the Village Ticket Office will be open throughout the game and for at least 30 minutes after full time too! Car Parks A, B, C and D will all be open as usual to season pass holders. Day passes for Claret Car Park will be available on the gate for £5. Car Parks open at 11.30am, please use NN5 5JT in satellite navigation devices for Car Park D.
Please also be aware that there will be no movement in VIP Car Park from ten minutes before the full-time whistle for 25 minutes. As usual, traffic management will be in place in Car Park D, Claret Car Park and on Edgar Mobbs Way. After the Car Parks close at 8pm on Saturday night, there will be no access to any vehicle left in the Car Parks over the weekend. Head down the back pitches from 9am on Saturday to catch the future stars of the game in our Under-14s tournament. And don't forget to give the players a big cheer as they complete a parade of clubs at half-time! This week we'll joined by Dunstable RFC, who will hold the Big Shirt as the team's run out this weekend. You can read more about Dunstable on page 40 of this weekend's programme, available around the ground for just £3.50. 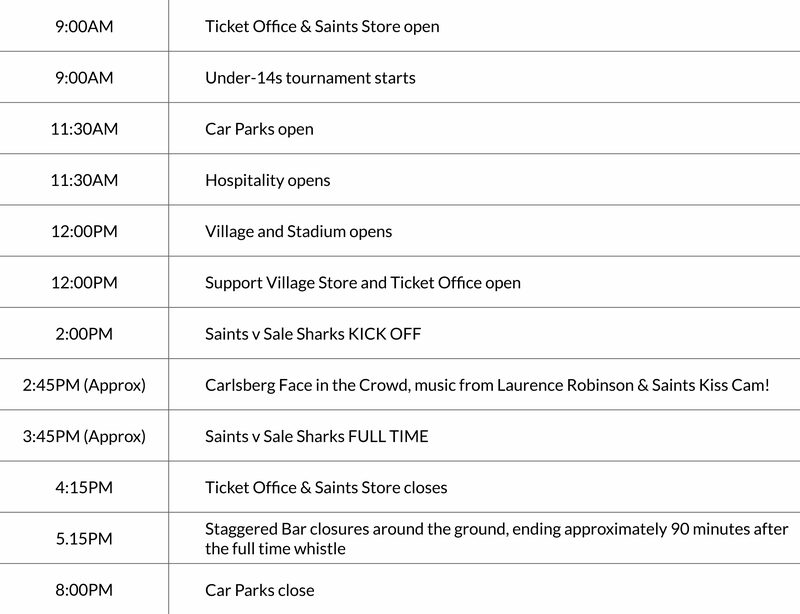 Expect to see all the usual Supporter Village activity including face painting and passing challenge, alongside the usual activity from our Club partners Spirit Hyundai, Toolstation, AutoWindscreens and Kubota. We'll also be joined by Laurence Robinson, an operatic tenor, who'll be getting us into the Valentine's spirit with some romantic tunes! Carlsberg Face in the Crowd returns on Saturday with the chance for one lucky supporter to win tickets to Saints v Bath. And while we're serenaded by Laurence Robinson, you could get yourself on the Big Screen in the Saints Kiss Cam!